In mineralogy, as in other natural sciences, there are strict rules on the naming of mineral species. In the past, the names assigned to minerals could reflect many things. 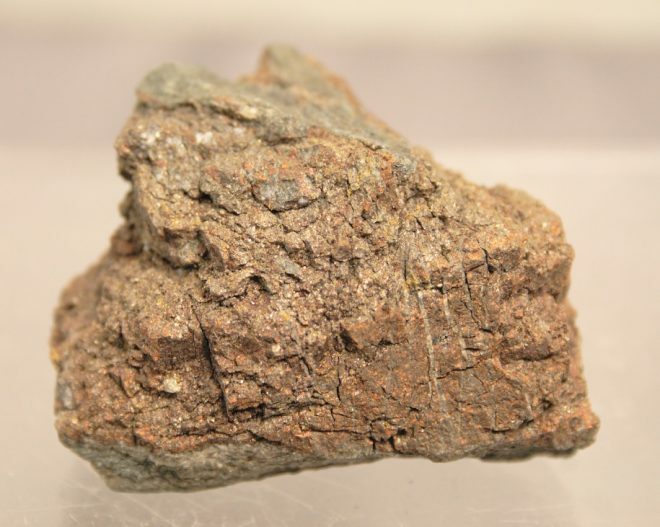 They could reflect the chemistry of the mineral, for instance, uraninite clearly refers to the presence of uranium, of which the mineral is a principal source. Others take their name from a specific property of the mineral such as pyrite (often referred to as Fool’s Gold) which is named after the Greek word for fire from its ability to generate sparks when struck, or orpiment, which takes its name from the Latin auripigmentum or gold paint in allusion to its colour. Today, the vast majority of minerals are named after a person or a place. Many of these names have strong obvious Scottish connections, while others are possibly a little less obvious. Pentlandite is an iron nickel sulphide with the chemical formula (Fe,Ni)9S8. It is found in nature as bronze-coloured, metallic aggregates in igneous rocks but has also been found in meteorites. It is an important source of the metal nickel and is found at localities around the world. Bronze-coloured pentlandite from Eas a’Chosain near Inverary, Argyll. But when it comes to the name we need to be wary. At first sight, it might be assumed that the mineral is named after the Pentland Hills or the Pentland Firth, two well-known Scottish locations. The area to the south of the city around Loanhead, which included the Pentland Hills, was called Pentland and the name is still found in Old Pentland Cemetery and Farm. This name may come from Middle English pent + land meaning enclosed land. Moving north, the origin of the name of the Pentland Firth has an altogether different derivation. This name is thought to originate from the Old Norse Petlandsfjörð (Fjord of Pictland) referring to body of water separating the Picts of the mainland from the Vikings who had by then occupied Orkney. The place-name Pentland also occurs in Canada, Australia and the USA. In actual fact, the name derives from a person and not a place. The mineral was named after Joseph Barclay Pentland (1797–1873). Born in Ballybofey, County Donegal, in Ireland, he was educated in Armagh before travelling extensively, studying in Paris with Cuvier then undertaking a survey of the Andes in Bolivia. 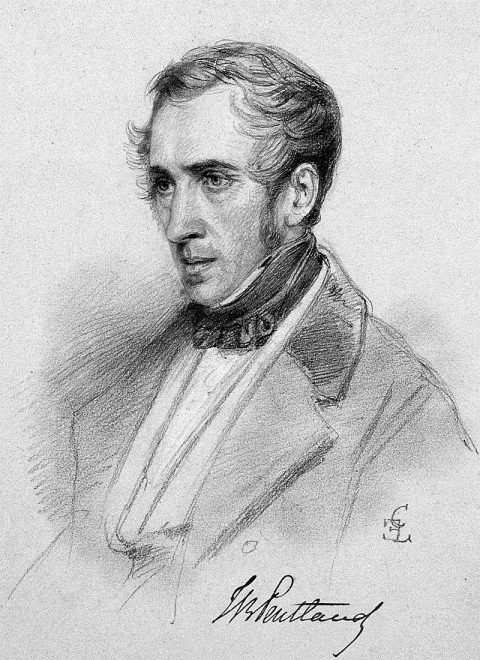 He was a regular correspondent of Buckland and Darwin. He had noted and worked on material from Sudbury in Canada and the mineral was named after him in recognition of his work. But the story doesn’t end there. The mineral that would eventually be named pentlandite was also found in older material from Craignure Mine in Argyll and from the Espedalen Mine, Gaudal, Norway. These two localities were named as type localities (a type locality is the place where a mineral was first described from). The surname Pentland is itself thought to have a Scottish origin and the first recorded instances of the name all occur in Scotland, around the Edinburgh area. It may be that the Pentland family from Donegal were part of the so-called “Plantation of Ulster” during the 17th century, when Scottish and English families were settled in the north of Ireland. 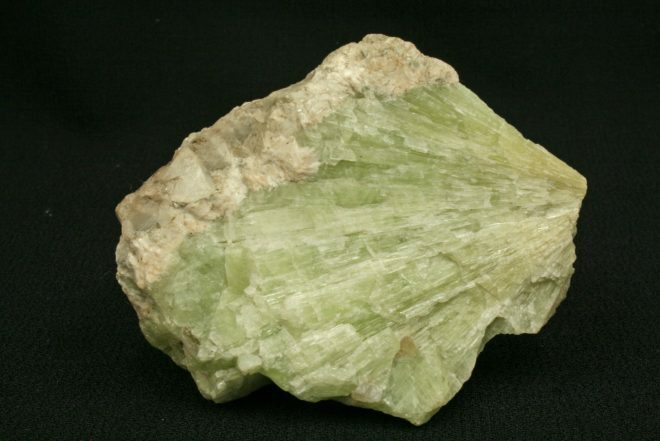 In contrast to pentlandite, strontianite has a much more straightforward history. Strontianite is a strontium carbonate with the chemical formula SrCO3. It is an important source of the element strontium but is a relatively rare mineral. Pale green strontianite from Strontian, Argyll. The mineral is named after the village of Strontian, situated on Loch Sunart at the base of the Ardnamurchan Peninsula in Argyll. The name Strontian derives from the Gaelic Sròn an t-Sìthein or the point (promontory) of the fairy hill – the hill itself lies just to the east of the village. The village does not have a long history, but the Peninsula has a long timeline of settlement by Picts, Scots and Vikings. St Columba is also known to have visited the area in the 6th Century. In 1722, galena (lead ore) veins were discovered in the hills above the present-day village and the landowner, Sir Alexander Murray, initiated what was to become 250 years of mining in the area. The remoteness and relative inaccessibility of the mines led to the establishment of the village of Strontian as a place to house the miners and their families, as well as providing somewhere to process and ship the ore out of. 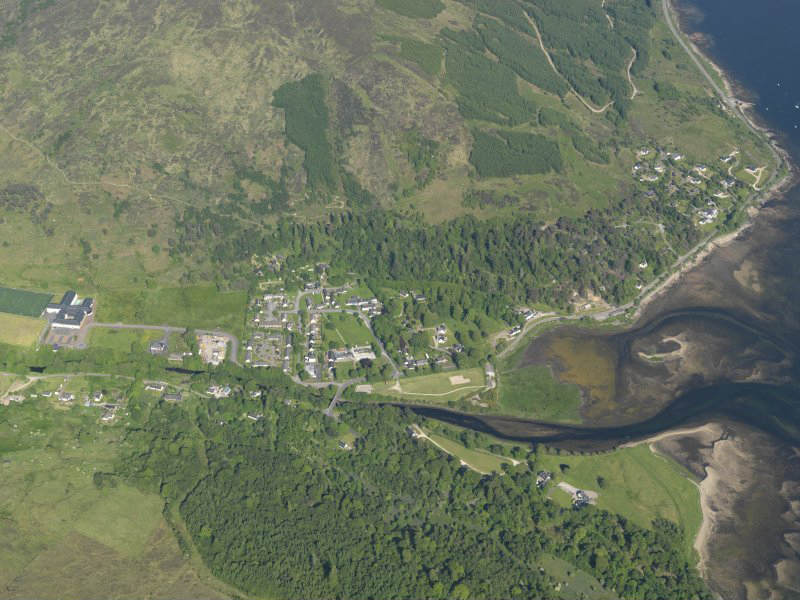 Village of Strontian from the air. Although the principal target of the mining operations was lead, other minerals were also found there. A pale green to brown mineral was discovered there and the German scientist Friedrich Gabriel Sulzer of Göttingen became the first to describe and name the mineral strontianit in 1791. The village of Strontian also gives its name to the element strontium. At the end of the 1780s, Dr Adair Crawford and Mr William Cruikshank were experimenting with material from Strontian and became aware that this material was behaving in a manner different from what they expected. After further experimentation and measurement, they concluded that this material must contain a new earth (element) and published the data in a paper in 1790. Finally, in 1808, the element was isolated and named strontium by Sir Humphrey Davy. So far, Strontian is the only place in the UK to have an element named after it. It is also the smallest (by population) habitation in the world to have an element named after it.